The gang over at Crimespree Cinema has asked some big names to contribute 5 favorites for 2009 – film, TV or DVD. Somehow I slipped through their defenses. My picks are up now. John Garfield may not have the same level of recognition as noir icons like Humphrey Bogart and Robert Mitchum, and the rediscovery of other names from the era like Richard Conte has allowed him to get lost in the cracks. But Garfield’s shadow may extend the furthest. The type of character he often portrayed – streetwise but fundamentally decent, a boyish tough guy who could be tamed – is a standard today. Put it this way: alone among his contemporaries, Garfield could have played either Matt Damon’s role or Leonardo DiCaprio’s in The Departed, and been brought back to read for Mark Wahlberg’s into the bargain. Watching two lesser known Garfield films with serious crime fiction pedigrees brought home the potency of that persona. 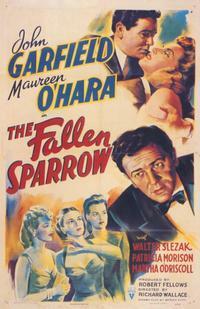 But Sparrow fascinates for several reasons. There’s a troika of interesting women, foremost among them Maureen O’Hara as an ice princess who only begrudgingly thaws. But it’s Garfield’s work as a proto-Manchurian Candidate, still suffering the effects of torture at the hands of his captors, that compels. The film’s MacGuffin is also just right, a mixture of nobility and stubbornness that suits Garfield to a T.
By comparison, Nobody Lives Forever is light entertainment. 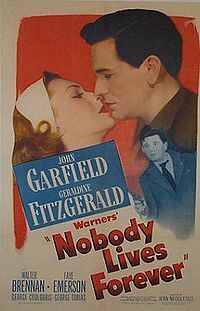 W.R. Burnett is credited as writing the original screenplay, but it’s adapted from a story serialized in Collier’s in 1943. Garfield is Nick Blake, recovered from his WWII service and ready to resume his grifting career. He lights out for the coast and sets his sights on a rich widow, but when he falls for her for real he has to deal his partners out. Nothing in Nobody is even remotely surprising, but the machinery is so finely assembled by Burnett and director Jean Negulesco that you’re happy to take a ride to a familiar destination if only to enjoy the scenery. George Coulouris chafes nicely as an aging con man who can’t accept that he’s no longer a pretty boy. Retro crush Faye Emerson is on hand as a bad girl, matched forehead for lovely forehead by Geraldine Fitzgerald as the pigeon who becomes a swan. But Garfield gives the enterprise life, charming as hell in rogue mode, touching when he goes soft on his mark. I’ve got some other Garfield films kicking around. It may be time to dig them out.